My poor scooter wetting itself. ﻿My Vespa GTL has been having a fuel system problem for about a year. I would have fixed the problem last year if I weren’t such a fair-weather rider. The problem is that it dumps fuel whenever I haven’t fired up the beast in four or five days. So, in good riding weather (mostly during the spring and fall), the issue doesn’t arise. The problem first occurred last summer when we had a short hot spell, and I didn’t take the Vespa out often. Then, the problem went away when the weather was more conducive to riding. Last winter, during a cold snap, I stopped riding as much and the problem returned. 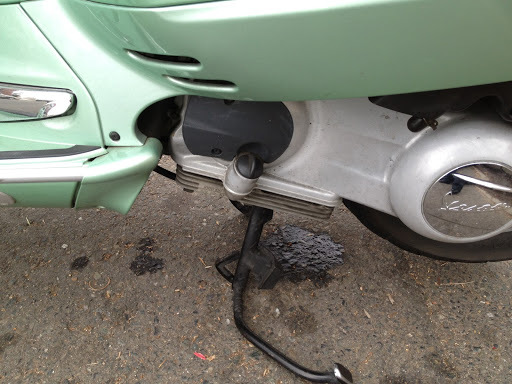 During this very hot summer, there were weeks when I would only take my Vespa out once—and each time, I would lose some fuel from the overflow/breather hose. It would continue to dribble fuel for the first quarter mile. Now, while I’m not riding it as frequently, it’s a good time to get the fuel system checked out and fixed. When my mechanic checked it out he found, among other minor things, the float sticks and the petcock (What a name!) needs replacing. With the scooter in the shop, it is time for another installment of a Scooterless Burger Scoot. In the nine years Chops Steak Seafood and Bar [http://chopssteakhouses.com/] has been here in Sacramento at 11th & L Streets, across from the State Capitol, I have been here about five times. Most memorable was the time we lost power in a storm. It was nice to go, since my wife and I rarely dine out. Today, I return to this cozy restaurant to (re)checkout the Chops’ take on a burger. The Capitol Burger is another burger with ingredients that—like many other comfort foods found on the menus of fine dining (meatloaf, ribs, mac and cheese, etc.) —redefine the great American Sandwich. My guess is there was a time one would have never found a burger on a menu that lists it as a main course under “Entrees.” The hamburger’s popularity and these tough economic times have made it a mainstay for all but the most specialized restaurants. The Capitol Burger with Pepper jack cheese and boring fries. The Capitol Burger is a 1/3 lb. of ground, tenderized filet mignon and sirloin. The patty is so tender that it melts in your mouth and almost makes up for that fact that there is so little fat in it—an element that makes burgers so great. If the patty were the only thing that mattered in a burger, Chops’ entry would be a very good burger despite the meat’s leanness. It is surprising how unimaginative the rest of the burger is. A very good French roll, good grilled red onions, but with this patty, I would have kept the onion crisp. The lettuce and tomato are fresh, but nothing exotic, just like the thousand island dressing on the roll. I ordered pepper jack, but wondered whether the bleu cheese would have been a wiser choice. 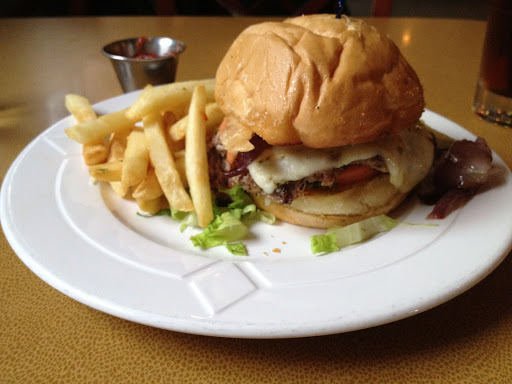 Too much bleu cheese can overpower a burger, or any other dish, but it might be the best option in this case. The Capitol Burger comes with a side. I ordered garlic fries, but was disappointed when I found they were thick-cut (read: boring) fries that required ketchup. My iced tea was good, which I expected from a nice place like Chops. For appearing so simple, hamburgers are a complex item—ahem—entrée: one or two pedestrian items can bring the whole experience down. At least, this is true with burgers from such a nice place as Chops. My conclusion is that the Capitol Burger is good, but it could have been much more if it offered something different besides a tasty bun and a good and unique patty. 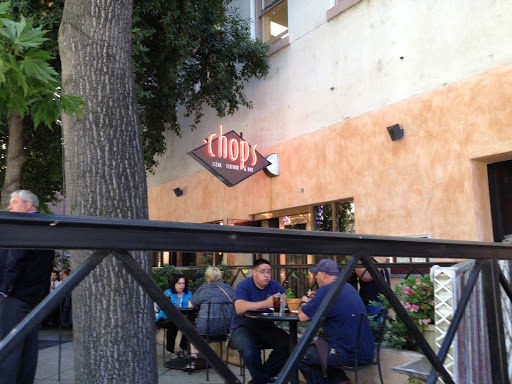 Chops’ chef should check out the burgers offered at Ella and Grange. As this post goes up, I have my scooter back from the shop. As suspected by everyone around me who has heard me talk about the Vespa, the two biggest problems were that the float needle was sticking after sitting too long and that the petcock was damaged. Now, my ride has a new petcock (I see a personalized license plate opportunity here), a re-made carb, and flushed-out fuel lines. The Burger Scoot rides again!